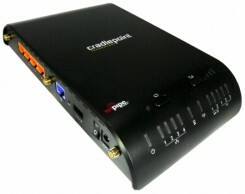 CradlePoint’s Mission-Critical Branch Router (MBR1400) takes the power and flexibility of our industry leading branch router, and when combined with an active high-speed wireless broadband data connection, gets your business network online in no time. Designed for small business, branch office, and retail locations – our business series branch router provides a secure primary or backup connection to the internet. In addition to connection options for traditional wired networking solutions like Cable, DSL, or T1, the most powerful feature of the MBR1400 is its ability to use USB or ExpressCard Data Modems to create instant networks anywhere you receive a broadband signal.